Brick pavers are some of the most versatile building materials on the market. If you are interested in constructing a patio, walkway, or driveway around your home, you should give serious consideration to using brick pavers in Southwest Chicago. At Allpro Contracting, our exterior remodeling services team would be honored to assist you with the effort. Since 1962, our Southwest Chicago remodeling contractors have been providing the highest quality brick paver installation and repair services. Our professionals take an immense amount of pride from the exceptional results that we achieve. The key to our success is simple. Each and every time we are hired for a task, our team works its hardest to maximize customer satisfaction. We will bring this dedication to excellence to task for you. If you are interested in constructing or repairing a brick paver patio, walkway, or driveway around your Southwest Chicago home, call Allpro Contracting today. Our polite and professional staff is ready and eager to assist you in any way that we can. Our knowledgeable experts can answer any of your questions about our skills and services. We can schedule your appointment today. One of the best reasons to use brick and concrete pavers for your hardscaping is that there is no limit to what can be accomplished. These amazing building materials come in a wide variety of shapes, colors, finishes, and designs. Concrete pavers can mimic natural stone and brick exquisitely well. When you hire our professionals for your paver patio project, you are guaranteed to make the best choices through the entire effort. 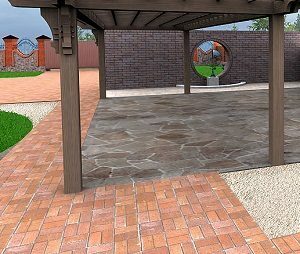 Our team can help you select the brick paver materials that you and your family will love the best. They will achieve all of your aesthetic goals. These additions will complement the architecture of your property while adding long-term value to your residence. In addition to constructing brick paver hardscaping areas, our remodeling contractors specialize in repairing these amazing features. This is another benefit of paver patios, walkways, and driveways. If one paver is damaged, it can be easily replaced. The entire surface can be sealed in order to protect your hardscaping well into the future. Our Southwest Chicago brick paver installation and repair professionals are ready and eager to assist you in this regard. With our help, your paver patio, driveway, or walkway will be restored to its original beauty in the best possible manner. You and your family are guaranteed to be pleased with the results of the effort. If you need brick pavers repaired or installed in Southwest Chicago, please call 708-658-3500 or complete our online request form.